Collections of riddles were known in Classical Antiquity, but in the Middle Ages were especially popular in Anglo-Saxon England. Some of them have still never been solved. 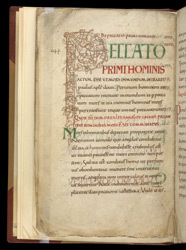 Collections in this manuscripts are attributed to St. Tatwin, archbishop of Canterbury (d. 734), and St. Aldhelm, Abbot of Malmesbury and Bishop of Sherborne (d. 709). Although it was probably written at Canterbury, this manuscript was seen in the library of Glastonbury Abbey in the 16th century, and had probably been there for most of the Middle Ages. Close examination shows that the green initial 'M' overlaps the lower extremity of the large interlace initial 'P': this suggests that the pen-and-ink work, both of the text and the interlace initial, were executed before the painted/coloured initials.